I add new link to customer account sidebar like in the image below. 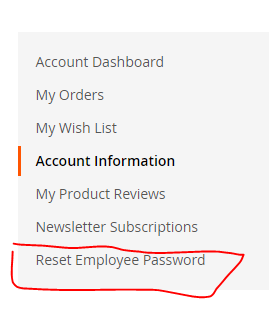 And i create new page for Reset Employee Password link, and it's done like in the image below. Then, my question is, how can i made my custom page like in the customer account page? (There's sidebar, and other things). Or for example, like in image below. I found the answer myself, if maybe someone want to do the same with me, just set the layout at your xml file to layout="2columns-left" and you'll get the customer account page sidebar like in the image below. Other links are coming from various different module you have to figure them out and add those block as arranged above. Not the answer you're looking for? Browse other questions tagged custom customer-account page magento-2.2.1 or ask your own question.